4 to max. 8 participants. 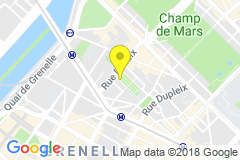 Group sessions in the 15th arrondissement next to the Eiffel Tower and Motte-Piquet Grenelle. Individual sessions at home, at office, in cafés or at museums. Every week will be devoted to one of the major daily-life topics. Get familiar with common and relevant vocabulary and adopt new learning strategies to memorize it easier and faster. Take a chance to assimilate necessary grammatical rules with a pragmatic and intuitive learning approach in the class and after the class on our online Learning Platform, Neo. Discover and use language tips to easily strike up a conversation. Get practical clues to catch and try to keep the attention of your French interlocutor. Face various situations and learn how to gain spontaneity in each of them. Improve significantly your French listening comprehension through adapted exercices. Get more familiar with the Parisian lifestyle and get better chance to connect with both French culture & people. Share and uncover great insider tips to explore and enjoy even more your living environment. Train your voice and master some of these tricky (terrible) French sounds that even your ears might not be able to listen to. Get better understood and improve your French listening at the same time. These fees are valid for private individuals who finance by themselves their training. Different prices apply for businesses and externally financed trainings. Check availabilities and apply now! You will get a free interview to meet the team, assess your level and confirm your application. Still some questions before getting in touch with us? Have a look at our FAQ! I would like to receive the newsletter to stay tuned about Novexpat's events & news.